Ellison Russell wanted a decorator, not a corpse. Too bad she finds Mrs. White in the study killed with a revolver. Things go from bad to worse when she finds Mr. White in the dining room killed with a candlestick. With so many bodies, is it any wonder Detective Anarchy Jones’ new partner considers Ellison a suspect? With the country club gossips talking a mile a minute, an unexpected cocktail party, a visit from Aunt Sis, and a romantic decision, Ellison hardly has time to think about murder. Unfortunately, the killer has plenty of time to think about her. Ellison Russell really needs to stop finding dead bodies. This story starts out like a game of Clue – Mrs. White in the study killed with a revolver – Mr. White in the dining room killed with a candlestick. All these bodies are driving her mother over the edge. Her Aunt Sis coming to visit doesn’t help matters. Detective Anarchy Jones knows Ellison didn’t kill anyone but his new partner isn’t so sure. With the ceiling literally crashing down around her she has no time to prove otherwise but the killer does have her in his sights. Julie Mulhern takes us back to the 70’s, no cell phones, big hair, cocktail parties and no Starbucks on every corner. Ellison and her romance with Mr. Coffee always brings a smile to my face. The story starts out with Ellison simple wanting to redecorate her study. Hunter sets her up with an appointment with his ex and in less than an hour her world is turned inside out. Ellison is a strong character, a widowed mom trying to raise a teenager on her own, a successful artist, trying to find her way in her family and in society. Her mother, Frances, demands perfection and Ellison always seems to fall short in her eyes. Her mother believes she needs a man in her life and while she already has two men interested she just isn’t ready for a serious relationship yet…but things are heating up and Frances may not be happy with her daughter’s choice. This is a fast paced story and it is full of absolutely hilarious moments. It does take a very serious twist at the end and addresses an important issue not talked about much in the 1970’s. It is still a hot issue today but it handled much more openly. Ms. Mulhern never disappoints. These characters are believable and the dialogue is crisp. She wraps them lively mystery that is beyond entertaining and she balances the drama with humor perfectly. I can’t believe how fast I read this book and was not ready to leave Ellison, her family and friends when I reached the final page. I hope the author doesn’t keep us waiting too long for the next episode. Write fast Julie!! For maximum enjoyment read this series from the start. The story is well-paced and the characters keep it moving. 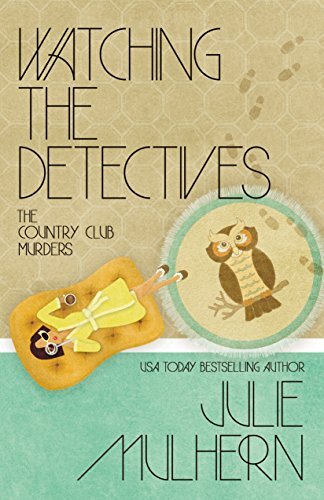 Pretty much every new Country Club Murder mystery I read I proclaim my new favorite and Watching the Detectives is no different! Right from the beginning I was completely sucked in. Watching the Detectives is a must read for anyone who loves a little “meat” to their cozy mystery and a good does of humor and wit to boot. Good mystery and well written. Enjoyable read! Great book for fans of fun cozy mysteries! – Julie Mulhern is the USA Today bestselling author of The Country Club Murders. She is a Kansas City native who grew up on a steady diet of Agatha Christie. She spends her spare time whipping up gourmet meals for her family, working out at the gym and finding new ways to keep her house spotlessly clean–and she’s got an active imagination. Truth is–she’s an expert at calling for take-out, she grumbles about walking the dog and the dust bunnies under the bed have grown into dust lions. I love a humorous mystery, so I know that I would enjoy this entire series! Have only been able to get audiobooks of Julie’s series from my library. Have read(listened to) the Deep End and currently am engrossed in Guaranteed to Bleed. Have found the plots and characters to be engaging and funny while at the same time touching on serious issues. Looking forward to the rest of the series. This is a new series to me. Sounds like a fun read. Looking forward to reading the book.